A music producer is a professional who works with recording artists and bands, sound engineers, record labels and marketing teams to oversee all creative and technical aspects of an album. The scope of the music producer`s duties can vary widely based on the type of band, label and project, but many responsibilities are common for all record producers. Many music producers recruit or arrange contracts with artists, but most communicate with other professionals in charge of these aspects of the business. 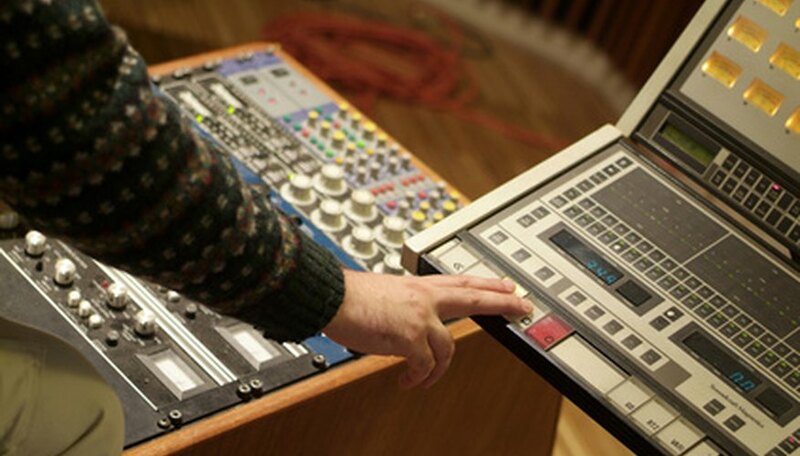 Producers working on independent music may have to secure funding, studio time and technicians. Producers meet with the artist and agree on what tracks to include on the album. For major label producers, a major consideration for this is what songs are candidates for marketable radio singles. Music producers oversee the recording sessions for the recording and provide feedback to the band and technicians. They are present during the mixing of the album when it all comes together to ensure it meets the standards of the artist, the label and themselves. Many music producers play a key role in strategy for the cover art, distribution deals and marketing plans for the final product. No formal education is required to become a music producer, but most successful ones have a degree in music or business management. Salary estimates vary based on the label, but the major label producers earn $30,000 to more than $50,000 annually, according to the College Crunch website. According to Pay Scale, "The job salary for a music producer is peanuts to caviar. On the low end, $20K per year; on the high end - over $1 million a year." The high end includes independent producers.